Joyce Carol Oates’ new novel is a big ragbag of ideas, some widely explored, others gently hinted at, all them pertinent to psychologists, applied and experimental alike. These include the treatment of female scientists, the thought processes of the amnesiac patient, and the symbiotic relationship between researcher and subject. Her narrative focus too, is immediately of interest: a male patient with partial retrograde and total anterograde amnesia whose stoical, decades-long involvement in research forms the foundation of our understanding of memory function and organisation in the brain. Oates has changed many of the biographical details of his case, but there are no prizes for guessing who this book is based on. Amnesia is a condition rich in opportunities for metaphor, and Oates takes full advantage as she charts the course of ‘Patient EH’s’ life as a research subject. Early on she evokes her protagonist’s dilemma as he converses with researchers: ‘His is the eagerness of a drowning person, hoping to be rescued by someone, anyone, with no idea what rescue might be, or from what.’ She returns frequently to the idea that Eli Hoopes lives in ‘an indefinable present-tense’ (an echo of Suzanne Corkin’s account of her work with HM, Permanent Present Tense), and the man himself reflects ‘without a memory is like being without a shadow’. Sometimes Oates writes dangerously close to cliché: I didn’t feel that the image of Eli as ‘a brave man who stands alone, as on a brink of the abyss’ helped my understanding of him very much. Elsewhere she grasps at an almost poetic style that gives the novel a dream-like quality, as when the researcher Margot suggests that her precarious status in Eli’s mind makes her ‘like a moon in a lunar eclipse’. Oates is at her best when she writes about the courteous, charismatic Eli, and the few sections written in his voice are startling in their empathy (much like Emma Healey’s exploration of dementia in the novel Elizabeth is Missing). His hypersensitivity to others’ reactions allows him to safely navigate conversations and interactions: ‘it is imperative, he knows, not to acknowledge any surprise or confusion’. Anxiety is ever-present for Eli, the simplest questions trigger panic and he must face the daily puzzle of the lab: ‘Always there are smiling strangers, happy to see him.’ In moments he tumbles into paranoia: how does Margot know about his sketchbook ‘unless she has been spying’ on him? Oates’s imaginative evocation of the amnesiac patient’s inner life is speculative, but it is warm and poignant, especially when she recounts Eli's sense that he must be gracious and diplomatic to the now ageing stranger, Margot, who has spent 30 years with him. Unfortunately, Margot is the weak point in this book. Initially I found her characterisation rather heartening. Introduced as a 24-year-old grad student assigned to a major neurological project, she ponders: ‘…will my life begin at last? My true life.’ and debates the fact that ‘catastrophe in one life… precipitates hope and anticipation in others’. This, it seemed, was a real portrait of a scientist as a human being. It quickly becomes clear, however, that Margot is, ethically, not much of a scientist and, with her total immersion in her subject, her eccentricities of hairstyle and clothing and failure to form meaningful relationships, she is still a bit of a cliché. Focused entirely on Eli and her work, Margot develops a ‘passionate, doomed and deranged love’ that leads her seriously astray by the book’s end. All the while she wonders whether her behaviour qualifies as scientific misconduct, generally managing to dismiss this as unnecessary worrying. a fascinating opportunity, badly squandered. Oates has researched her novel thoroughly, with many references to findings on HM (such as the distinction between declarative and procedural memory). I even wondered if the initialled name EH was a sly reference to founding father of memory research, Hermann Ebbinghaus. And it has been broadly well received in the mainstream press. But I found it impossible to suspend the disbelief that Oates’s surreal depiction of Margot’s amour fou requires. Instead I found myself yelping in alarm every time the irksome Margot broke another ethical code. For all its empathy with the amnesiac patient, this is a novel I would rather forget. 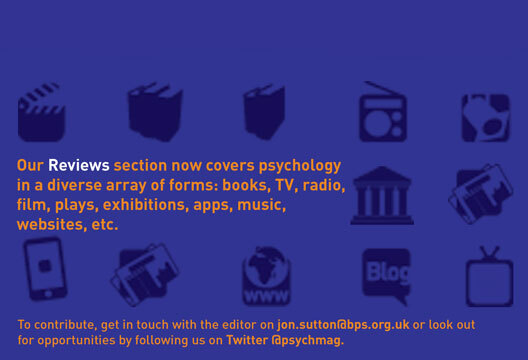 - Reviewed by Sarah A. Smith who is a Graduate Member of the British Psychological Society.